On red carpets and at prestigious events around the world, black always exudes classic elegance. Traditionally reserved for the big occasions, it symbolises simplicity in its purest form. All the top fashion designers have poured their energy and creativity into reinterpretations of this timeless classic. Hublot is leading the way in its Haute Horlogerie collections with an evening watch designed as an extension of this iconic garment. 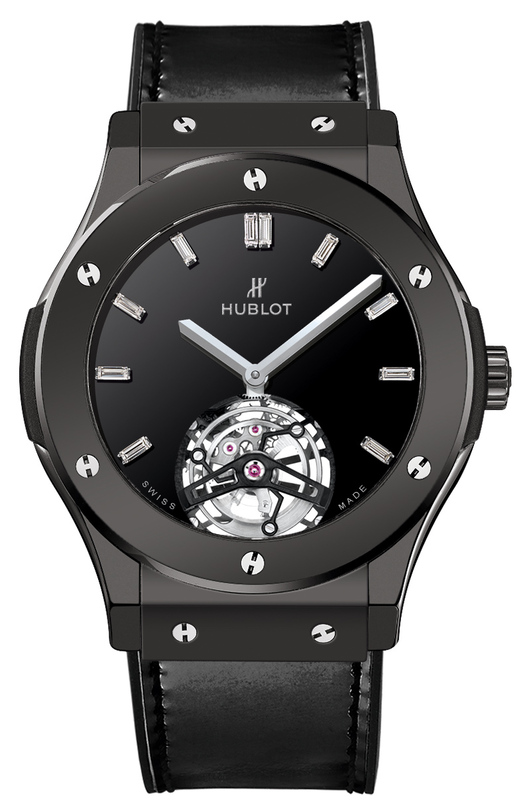 45 mm in diameter, made from black polished ceramic, with a black lacquered dial set with 10 baguette diamonds for an exceptional lustre, two polished, rhodium-plated hands and an opening at 6 o’clock revealing the magic of a flying tourbillon, this watch also features a sapphire case-back through which the HUB6010 movement (155 components, 5-day power reserve) can be seen. The movement is entirely developed and produced in-house by the engineers and watchmakers of the Hublot manufacture. The watch sits on a strap of shiny black calfskin sewn onto rubber, for comfort and flexibility, making it the perfect accessory for the gentleman in evening wear. The tuxedo was originally an inner jacket, worn by British gentlemen, which allowed them to smoke cigars outside so as not to inconvenience the ladies. Popularised by the Prince of Wales, the tuxedo has become the essential elegant evening wear for gentlemen, so much so that “Black Tie” events now stipulate it. Combined with a bow tie, cufflinks, a cummerbund and patent shoes, the effect is completed by the sober, elegant Classic Fusion Tourbillon Nigh-Out, for a flawlessly contemporary look.